In this post I continue on from the notion I oultined in my last one that a ludic understanding of a much broader range of cultural activity than we generally place under the rubric “play” might let us use Gregory Nagy’s insights into the interaction of rulesets and performances to create meaning in the service of developing a thicker description of our relationship with transmedia art. In turn, that thicker description of practomime’s meaning-effects in culture, I begin to suggest in this post, will allow us to mount a defense of humanistic living, since only by living with a nuanced understanding of the cultural materials of the past (history, literature, philosophy) will we be able to iterate our rulesets prosperously. Nagy theorizes that meaning arises in oral poetics through the interaction of synchronic elements (performance) and diachronic elements (ruleset), so that the whole range of previous performances, as part of the materials available to the performer, defines the choices made by the bard. That kind of meaning-producing intersection of the now and the eternal also defines the way a player’s performance in a digital RPG is defined just as much by what s/he does not choose to perform as by what s/he does. The connection of this basic principle of practomime, within which the meanings of new works depend on the rules within which they arose, shaped not just in the immediate performance context but by millennia of development, from oral poetics through to digital games, suggests that the culture of ancient Athens, shaped as it was by ludic agonism–the practices of competition–can provide a great deal of assistance in describing our own transmedia practices. The most telling indication that the ludic is at work in Athenian culture may be Cleon’s rant in Thucydides’ rendering of the the Mytilenian debate (ἁπλῶς τε ἀκοῆς ἡδονῇ ἡσσώμενοι καὶ σοφιστῶν θεαταῖς ἐοικότες καθημένοις μᾶλλον ἢ περὶ πόλεως βουλευομένοις “you are simply overcome by pleasure of hearing and are like a seated audience of wisdom-performers [sophistōn] rather than men taking counsel about their city” [Thucydides 3.38]), but the more trenchant critique is Plato’s, in Socrates’ story of the cave, when Socrates asks whether one wouldn’t rather be the paradigmatic Achilles-according-to-Odysseus-according-to-the-homeric-bards slave of the meanest farmer than win the contests of the cave-dwellers (Odyssey 11, as paraphrased by Socrates in Republic 7). Both these examples are about what we would call “immersion”: Cleon criticizes the Athenians for their immersion in speeches; Plato criticizes them for their immersion in the honor-game such speeches have created. 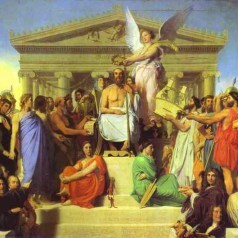 Either way, we see an audience whose engagement with their ruleset has lost a connection to the antecedents of the ruleset: their culture has become anti-humanistic, as Thucydides complains time and time again as he berates the general public for believing whatever anyone tells them about the past (he means Herodotus, of course!). Plato’s cutting irony in using the example of Achilles’ words to Odysseus to urge his audience to snap out of their immersion has even greater point: they love their Homer, but they’ve utterly missed the ethical point of Achilles’ and Odysseus’ struggles. The epic life is the performative and iterative life. We live it within a representation we call the “real world.” That “world,” as Plato told us, is always available to be viewed as always already virtualized, already a performance and an iteration of a ruleset (cf. e.g. Lacan’s mirror-stage). Inside that “real world” symbolic life, however, lie countless opportunities for other iterable performances. Some of these are playful: we can call them games, or stories, or art. How do we learn to iterate our performance of the “real world”? By learning to iterate these play-performances as precisely as possible. How do we learn to evaluate and refine our performances? Only one set of fields can do that: the set of fields that has studied the development and iteration of these iterable play-performances for centuries, the humanities. The news that a player of World of Warcraft or Farmville is performing a ruleset with a distinct and traceable relationship to the “Embassy to Achilles”–the news, that is, that there is a great chain of practomime of which that player is a part, along with the homeric bards, the philosophers of the Academy, and the classicists who analyze these things, along also with every other humanist and every other player of the game of culture–is generally, if my experience is anything to go by, less welcome to that player than a well-meaning homerist would tend to suspect. Part of the trouble we have expressing the value of the humanities these days is the way humanists’ old, old elitism has driven off the players of our games from our own analytic performances. We’re going to need those players, though, going forward. We’re going to need to convince them that they’re playing the same game we are, and that together we can make it more fun for everybody. What better, then, than a return to the work of one whose career has been devoted both to minute analysis of these ludic practices at their origins in Indo-European culture and to sharing the stunningly enriching implications of that analysis for our lives in our modern one?